Lee Hee-joon (born June 29, 1979) is a South Korean actor. Lee Hee-joon and model Lee Hye-jung confirmed their relationship in August 2015. They registered their marriage prior to the ceremony and had their private wedding ceremony in a wedding hall in Yongsan, Seoul on April 23, 2016. 2012 Drama Special - "Swamp Ecology Report"
^ "Stars from Korea National University of Arts". Hancinema. ETO. May 17, 2012. ^ Lee, Ga-on (October 26, 2011). "My Name Is: Lee Hee-jun". 10Asia. Retrieved 2012-11-22. ^ "Actor Lee Hee-joon and model Lee Hye-jung are getting married". Hancinema. Star MBN. December 4, 2015. ^ "Koh Joon Hee and Lee Hee Joon Play Couple in Upcoming Film 'Marriage Blue'". BNT News. November 8, 2013. ^ "Lee Hee-joon joins "Haemoo"". Hancinema. Newsen. October 1, 2013. ^ "[bnt interview] 'Robot, Sori' Lee Hee Joon, the Beauty of Sympathy". BNT News. January 26, 2016. 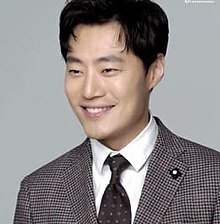 ^ "LEE Hui-joon Added to PRECIOUS LADY". Korean Film Biz Zone. February 3, 2016. ^ "PARK Hee-soon and LEE Hui-joon Travel Back to 1987". Korean Film Biz Zone. February 27, 2017. ^ "Han Ji-min, Lee Hee-jun to star in 'Miss Baek'". Korea JoongAng Daily. January 19, 2017. ^ "Lee Hee-jun to take walk down 'Yuna's Street'". Korea JoongAng Daily. March 21, 2014. ^ "Lee Hee-joon to star in "The Legend of the Blue Sea" with Park Ji-eun". Hancinema. Xports News. October 10, 2016. ^ "이희준, OCN '미스트리스' 남자 주인공 출연 확정". Star MK (in Korean). February 21, 2018. ^ "Shin Ha-kyun scores top prize at 2011 KBS Drama Awards". 10Asia. January 2, 2012. ^ ""You Who Rolled In Unexpectedly" Dominates At Korea Drama Awards". KBS World. October 4, 2015. ^ "2012 KBS Drama Awards : Winners' List". Hancinema. January 1, 2013. ^ "The honorable winners of the 49th PaekSang Arts Awards". Hancinema. News1. May 9, 2013. This page is based on the Wikipedia article Lee Hee-joon; it is used under the Creative Commons Attribution-ShareAlike 3.0 Unported License (CC-BY-SA). You may redistribute it, verbatim or modified, providing that you comply with the terms of the CC-BY-SA.